Imagine you’re at a party and you’re having a conversation with a friend. There’s music in the background, people are talking and laughing, and out of all that noise you’re able to focus in on your friend’s voice. How are you able to do that? While the details of human perception are complex, part of the reason you can pick your friend’s voice out of the noise is that you already know what your friend sounds like. It’s a trick we also use in gravitational physics. One of the biggest challenges with detecting gravitational waves is pulling the signal out of the noise. Even strong gravitational waves such as those from two merging black holes are incredibly faint, and there are lots of sources of gravitational noise. So to help distinguish a real signal from the noise you need to know what a real signal might look like. That means you need to use general relativity to create models of things such as binary black holes. Unfortunately there isn’t a simple solution to the Einstein field equations for two large masses. We need to use computer simulations, and even then there are significant challenges. To make the solutions possible, models would typically use certain tricks such as choosing a reference frame that moves with the black holes, or looking at different aspects of a model black hole merger and stitching the solutions together. But in the mid 2000s computational physicists started to develop models that didn’t require these kinds of tricks. Some of my RIT colleagues, for example, created a model of two black holes starting at their closest stable orbit and spiraling inward to create the final merged black hole. Computer models such as this finally allowed us to simulate the gravitational waves from black holes in an accurate way. As the power of computer clusters grew, we were able to run simulations like this for a wide variety of situations, for black holes with different masses and different rates of rotation. This way we could build up a table of possible mergers, similar to the way we have an archive of how our various friends and family sound. So when LIGO detected a spike of gravitational waves that looked like a merger, they could compare the signal to a range of simulations. They were able to match the observed waveform to several similar theoretical mergers, which not only confirmed it was indeed a black hole merger, but could also determine characteristics of the black holes. We know, for example that the two black holes had masses of 36 and 29 solar masses, give or take about 4 solar masses. We also know the final black hole is about 62 solar masses (give or take about 4 solar masses) and that it rotates at a rate of about 67% of the theoretical maximum. 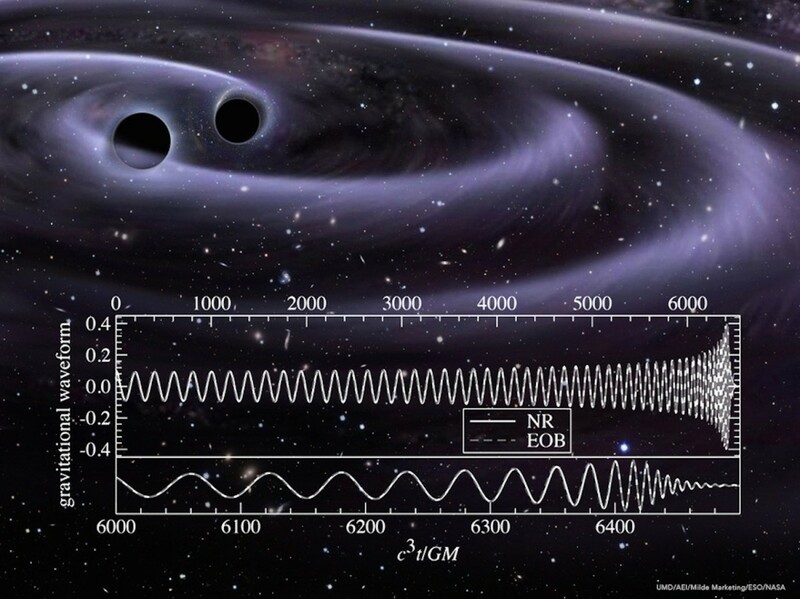 Without computer simulations of black hole mergers LIGO wouldn’t have been able determine the properties of the merging black holes. By using computer models hand in hand with observational data, we’ve been able to enter a new age of gravitational astronomy. Dr. Koberlein, I’m still confused of where ~3 solar masses of GW energy came from. It seems the energy can me from the black holes masses (36 + 29 > 62). How could that be, black holes “losing” mass other than via Hawkins Radiation? The idea that nothing can escape a black hole is a bit simplistic, and really only applies to simple, static black holes. As soon as you have two black holes colliding things become complex and energy can escape a black hole, particularly through gravitational waves. As I understand it, and I’m not a professional astrophysicist, the three solar masses were converted into the energy of the gravitational waves. Sixty five solar masses before the collision and sixty two solar masses afterwards liberates three solar masses worth of energy which then rippled out across the Universe.